Prepared by Bao To, MD , Department of Radiology, University of California San Francisco; and Marcia McCowin, MD and Stephen K. Gerard, MD, PhD , San Francisco VA Medical Center and Department of Radiology, University of California San Francisco, San Francisco, CA. A 45-year-old man with hepatitis C was admitted with extreme volume overload, platypnea, and hypoxia. An echocardiogram showed evidence of pulmonary hypertension, no signs of heart failure, and a bubble study suggesting an extracardiac shunt. Arterial blood gas measurements repeatedly revealed hypoxemia with oxygen saturation in the range of 80% to 90%. 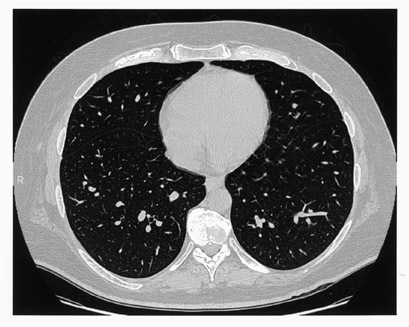 A ventilation/perfusion (V/Q) scan showed a low probability for pulmonary embolism (not shown), and a chest computed tomography (CT) scan was negative for significant pulmonary disease (Figure 1). The patient's volume overload and hypoxia were believed to be associated with worsening liver failure. He was heavily diuresed and discharged. His hypoxia became worse over time, requiring increased home oxygen support. Several years later, a repeat echocardiogram showed resolution of pulmonary hypertension. A liver biopsy confirmed end-stage liver disease and hepatic cirrhosis and he was placed on the liver transplant list. A repeat CT scan and a shunt study with intravenous (IV) technetium-99m (Tc99m) macroaggregated albumin (MAA) (Figure 2) were performed to evaluate his hepatopulmonary status prior to liver transplantation. Right-to-left shunt associated with microscopic pulmonary arterial venous malformations (PAVMs) secondary to hepatopulmonary syndrome (HPS). 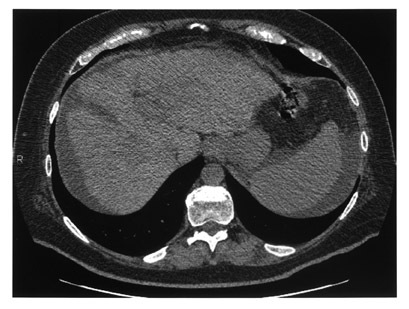 High-resolution CT images showed evidence of cirrhosis and end-stage liver disease, including a small liver with nodular contour, abdominal ascites, and splenomegaly (Figure 1). There was no evidence of macroscopic PAVMs or parenchymal lung abnormalities. 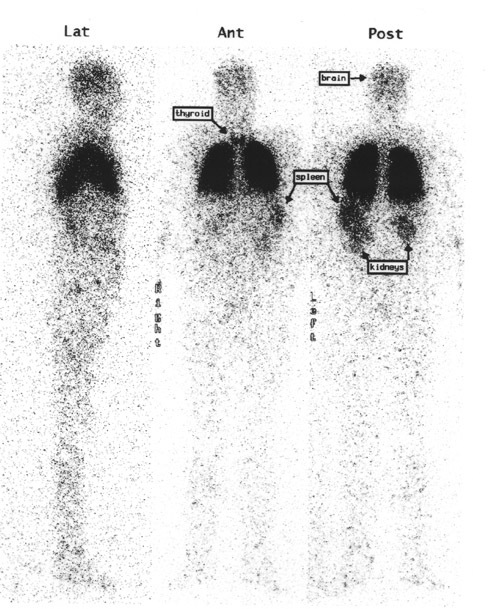 A shunt study with IV Tc99m-labeled MAA, using a low-particle preparation (see below), shows activity in the kidneys and brain, in addition to normal lung activity (Figure 2). 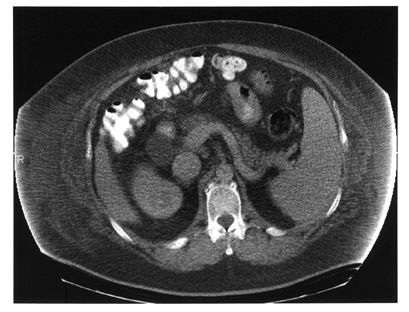 Also noteworthy is visualization of the spleen, consistent with splenomegaly, evident on the CT scan (Figure 1). The thyroid gland is also seen in the anterior view (Figure 2). Diffuse soft-tissue uptake labeling the whole body is also best appreciated in the lateral projection. These findings are con- sistent with a significant right-to-left shunt. Quantitative analysis estimated a 26% shunt fraction (Figure 3). Aside from microscopic PAVMs associated with HPS in advanced liver disease, right-to-left shunt can also be seen with macroscopic PAVMs most frequently associated with hereditary hemorrhagic telangiectasia (Osler-Rendu-Weber disease) and with congenital intracardiac anomalies, including Eisenmenger's complex, tetralogy of Fallot, Ebstein's anomaly of the tri- cuspid valve, and pulmonic stenosis with atrial septal defect. When performing a pulmonary perfusion study with Tc99m MAA in a patient with a known or suspected right-to-left shunt, it has been recommended that a low- particle preparation be used to minimize the extent of systemic arterial embolization. 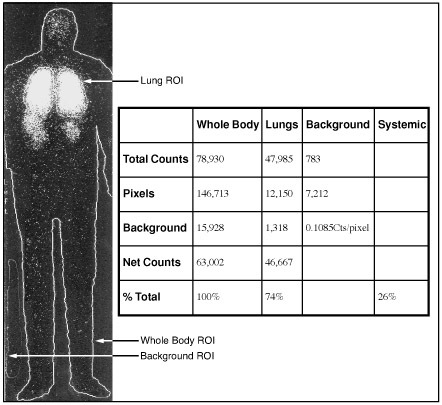 14 Normally, ~1 million particles 10 to 40 µ in size are injected IV for a standard lung perfusion dose of Tc99m MAA. It is recommended that this be reduced to 100,000 to 200,000 particles in the setting of right-to-left shunt, as was done in this case. (ROIs) over the posterior whole-body image that is acquired 2 minutes post-tracer injection for 15 minutes. An alternative method of right-to-left shunt quantification derives an estimate of total body counts from the measurement of renal and/or cerebral activity, assuming a given fixed proportion of total body blood flow. 6,11 While this approach may simplify determination of the total body counts, interpatient variability of the (renal and/or cerebral) to systemic blood flow ratios could introduce some imprecision. Quantification of the whole-body counts directly, as was done in this case, avoids this potential source of error. Right-to-left shunt due to microscopic PAVMs is a manifestation of hepatopulmonary syndrome in ad-vanced liver disease. Although PAVMs are not readily evident radiographically, findings associated with chronic liver failure on CT along with evidence of right-to-left shunt determined by whole-body Tc99m MAA imaging in the appropriate clinical setting can confirm this diagnosis noninvasively. Right-to-left shunt associated with microscopic pulmonary arterial venous malformations (PAVMs) secondary to hepatopulmonary syn. Appl Radiol.